I have heard if this ,in relation to your picture it is not healthy to experience this scary situation, it is more then people want to admit. It is known as a spirit or spirit demonic angels that are scaring you to show their power . To be in fear of them. Many times people invite them in their home by items, that deal with witchcraft, boards, voodoo,some time crosses, and many spiritism objects. , they cause a feeling of not being able to move. But you are aware of your total surroundings. Sometimes vibrations happen with this experience. The only cure to not experiencing this is get rid of objects that attract them and people who welcome them , And also pray for the true God's protection. Psalms 83:18. This is real no fairy tale. Anyone can experience this situation, there is no preference in man,woman or ,child, you do not have to welcome them on purpose, but they can be attracted by things people have or bring in the home, or things people have used to practice spells . I only had sleep paralysis once and I was conscious enough to know why I was paralyzed and why there was the cutest damn gray alien standing at the end of my bed! I was far more entertained than scared, annoyed I couldn't pet it's big pear shaped head, but I guess if I didn't know what was going on that might not have been the case! Never met a demon but I'm happy to say I did meet an alien, even if it was just a vibrant hallucination.... flippin' adorable. You called him and Alien at that time you would not think or know what he is. But they appear as shadowy figures of who they want to be.they are fallen or dark Angels , Something in your home he is attracted to. A thing or action of human danger . It is like a curse object that the spirits/ghost keep going after it. But I am glad I've never experience it, I've only heard stories from other friends. People call them ghost ,but they are old spirit dark angel who lost their position in the heavenly realm, they can appear as images, they also can mess with you sexually and the worse kill you. God Almighty protects us if we allow him ,they fear him. The whole thing was terrifying. I wanted to wake up but couldn't; wanted to scream but couldn't. It was scary. My worst experience was when i was falling a sleep... the fan next to me sounded like it slowed to a stop , that sound when something electrical dies. everything went silent. All i remember feeling was scared, i couldn't yell for my gf next to me i couldn't move art all. i tried as hard as i could to scream and nothing.. a couple of moments later the fan started going again and i was out. and I"ve had this happen to me multiple times. I've never flirted with the demonic in any way or welcomed any spirits into my home. When people come in my home they feel God's presence... Unfortunately these episodes of sleep paralysis are accompanied by things people fear, and you basically have a nightmare where you are half conscious. Out of ignorance people associated it with evil. What does my dream mean when its like i can't move, and i want to & i struggle but it feels like...somethings holding me down.. I can't talk but i want to scream out for help but nothing comes out. Spirit/Demon Visit or Sleep Paralysis? 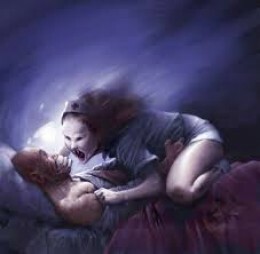 Been reading a lot of hubs on this lately, from Incubi/Succubi to general spirits visiting to the sleep paralysis argument.What do you think? !